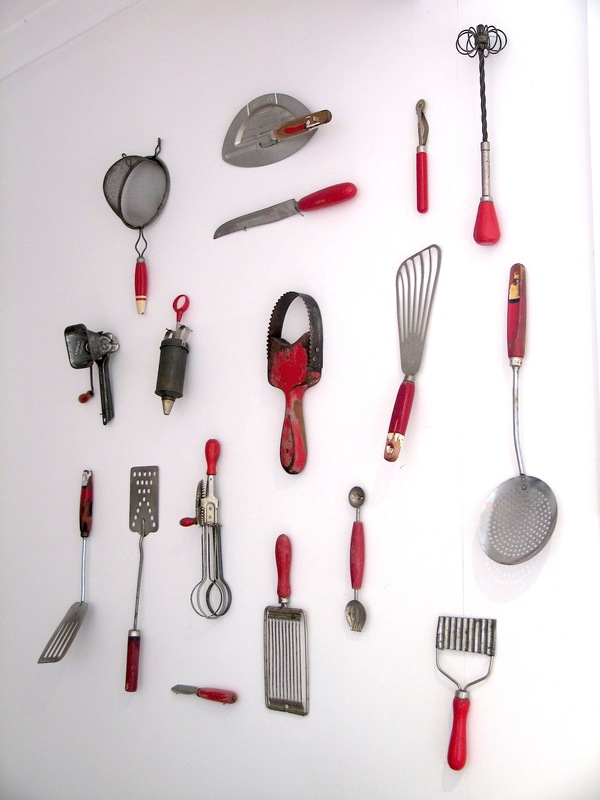 I have completed my Kitchenalia wall [collection of red vintage cooking utensils] | Hey Bernice! I’ve talked up the great finds I made over the Christmas break, and think it necessary to share with you the finished collection. How do you know when you have finished collecting something? Quite simply, when you run out of wall space in the kitchen! I’m rather happy with the variety I got my hands on. There are some very unique pieces in the collection (and some I am still not sure of their exact purpose). What excuse am I going to use to enter an antique shop now? I used small nails to hang each utensil. The tricky part is working out where to place the nails to ensure that the utensil hangs on the angle you want. There is some creative placement of nails for some of the utensils. I love that, I just re-did my kitchen and am into vintage utensils and decorate things. I am currently working on displaying my old utensils on a wooden rustic piece of wood and using spoons as hooks. Where can I find these kind of utensils? I’m not sure where you are located, but I am actually selling all of these. My new home doesn’t have a wall big enough to display them – If you are interested in buying any of them let me know!